Financially troubled shipyard Sainty Marine has failed to report to the stock exchange a bundle of lost orders, breaching information disclosure rules. 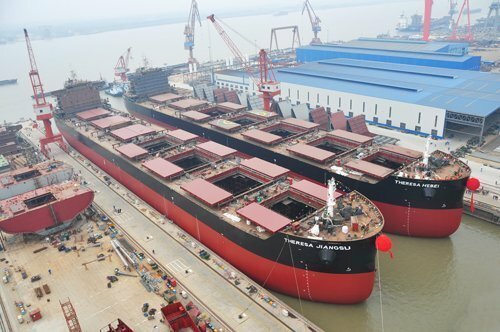 Sainty Marine had announced new orders for 35 vessels in total from 2014 to 2015, made up of six 12,000dwt multi-purpose vessels from Zeaborn, four 2,350teu boxships from Universal Marine, eleven 24,600dwt chemical tankers from Celsius Shipping, ten 64,000dwt bulkers from Precious Shipping and four 5,000teu boxships from Reederei NSB. Zeaborn, Universal Marine and Celsius Shipping have since all cancelled their orders at the shipyard, while the Reederei NSB order never became effective. However, Sainty Marine has so far only reported to the stock exchange the order cancellation from Universal Marine. In April Shenzhen Stock Exchange made an announcement in which it has denounced Sainty Marine for violations of information disclosure rules. It is no likely to face more scrutiny from the exchange. Sainty recently lost another eight orders when Nantong Mingde Heavy Industry Group went bankrupt on July 31. Sainty Marine said that it has to repay the buyers around RMB800m ($128.9m) in prepaid money and interest on the orders that were lost due to Nantong Mingde’s bankruptcy, and that it could lose up to RMB2.9bn if the restructuring of Mingde Heavy Industry fails.